Whether your bedroom is elegant, or it’s cozy or happy colored, you may need something more to complete that look that you wanted. You can add that final touch with the duvet cover for your bed. There are various options; they come in many colors, fabrics, patterns and they all have the ultimate purpose: to complete the aspect of your bedroom. From the numerous products on this market, we decided to give you the best 15 options. The first 15 duvet covers that thanks to their fabric, pattern, quality, and price satisfy all your demands and needs regarding this matter. Some may look too expensive, other you may not like them for their pattern. No matter how picky you are, it’s not quite mission impossible to find one that completes the appearance of your bedroom. Hop in, enjoy the ride, and think positive; the best duvet cover for you may be right below! Whenever you feel ready to try a bold vibe in your bedroom, don’t hesitate to give it a go with a duvet cover like the Printed Duvet-Cover-Set by Utopia Bedding. The set includes a duvet cover and two shames with 2-inch flange so it may change the whole appearance of your bed. The duvet cover is made with brushed microfiber that not only feels great against the skin, but it’s also very easy to take care of. The cover has a nice feel to it and improves your comfort with its softness. The fabric isn’t just soft, but also breathable and wrinkle free. The duvet cover is fade and stain resistant and very easy to maintain as it’s machine washable. You should not use bleach though and only use warm water when washing it. The duvet cover repels dust mites, as it’s hypoallergenic, so it’s a healthy choice if you’re dealing with some allergies at the moment. It’s impossible not to like the pattern of the set and the white fretwork pattern on grey or navy base sure makes a nice impression. The hidden zipper closer doesn’t just makes it easy for you to put on/take off the cover, but it also improves the whole design of the duvet cover. The duvet cover looks well made and presents hotel quality. The colors are vibrant and don’t fade away fast. Comfortable and soft, the duvet cover does make a statement in any bedroom. 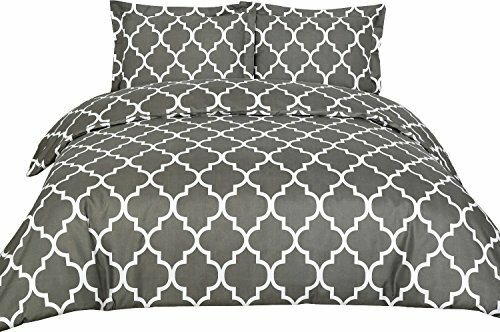 The bold pattern, the comfort, the nice features, and the low price make the duvet cover a great bang for your buck anytime. Just because the duvet cover isn’t high priced, doesn’t mean you’re getting a lemon. 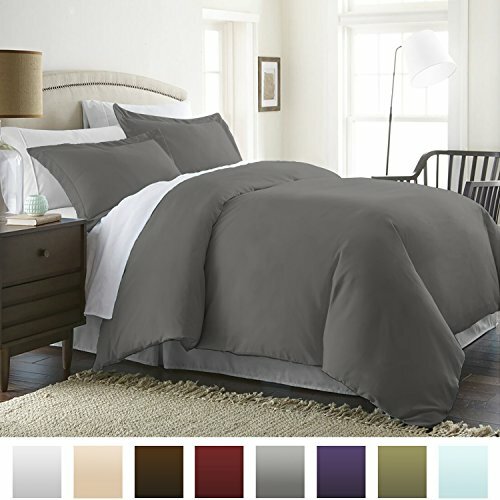 The HC COLLECTION – 1500 Thread Count Egyptian Quality Duvet Cover Set Full Queen Size, 3pc Luxury Soft, Queen Gray sure proves you wrong and manages to be a good option that balances so well price and quality. The duvet cover has a good quality built and is made with high quality imported double brushes microfiber grains. The special weaving process gives you a dense fabric with thin strands that feels so nicely against the skin. The soft touch feel and the nice texture increase comfort and improve your sleep, for sure. The fabric is also quite long lasting and takes washing very well. It’s very easy to take care of as it doesn’t wrinkle either and is fade resistant. You don’t have to iron it. In order to expand its life span, it’s better to only wash it in cold water with similar colors and never use bleach. You shouldn’t dry it clean either. The duvet cover looks nice for quite some time and doesn’t wear out that fast as long as you follow the simple instructions. We like the duve fabric as it’s a safe choice for the allergic customer as well. 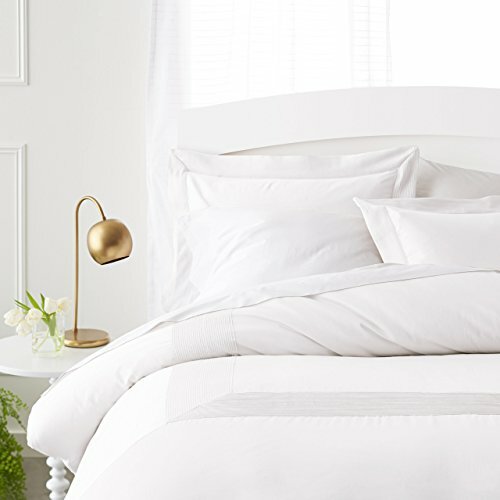 As a matter of fact, the duvet cover is resistant to dust mites and hypoallergenic so in case you’re struggling some allergies, don’t hesitate to try it. The design of the duvet cover is nice and its sophisticated vibe fits in many bedrooms. The duvet cover is lightweight and comes with a button closer. It comes in nice, vibrant colors and the duvet cover runs true to colors. It’s easy to put on the duver cover and to take it out for cleaning. Despite the minor issues, there are more things that we really like on the duvet cover so we think it’s a great choice anytime. Do you want to bring a colorful, exotic vibe to your room without paying too much money? Dare to get an exotic duvet cover like the Vaulia Lightweight Microfiber Duvet Cover Set that is not only fun to watch, but also comfortable for your sleep. The duvet cover is highly versatile as it has a reversible color design. When you get in the mood to change the vibe in your room, simply flip out the duvet cover. The Bohemia exotic pattern sure makes a great first impression on anyone and creates a nice, artistic atmosphere in your room. The fabric is 100% polyester microfiber so it means the duvet cover is not only nice, but also soft and pleasant to touch. The duvet cover is lightweight and comes with a hidden zipper closure. This way it’s very easy to put on/take off the duvet cover and the cover still remains elegant. The ties inside give a good hold to the comforter insert so you sleep throughout the whole night, with no worry for shifting. You also get two pillow shams that match the duvet cover, for more convenience and nicer appearance in your room. As for the care, no worries on that either as the duvet cover is removable and may be washed with cold water just as a bottom sheet, with no need for cleaning of the comforter. You shouldn’t bleach or dry-clean. It’s better to tumble dry on low heat setting and only iron it on a medium setting. The duvet cover runs true to colors and to size. It doesn’t wrinkle and its pattern is definitely the main attraction. For the impressive pattern and reliability, the duvet cover is truly an artistic option to have in mind especially when shopping on a fixed budget. 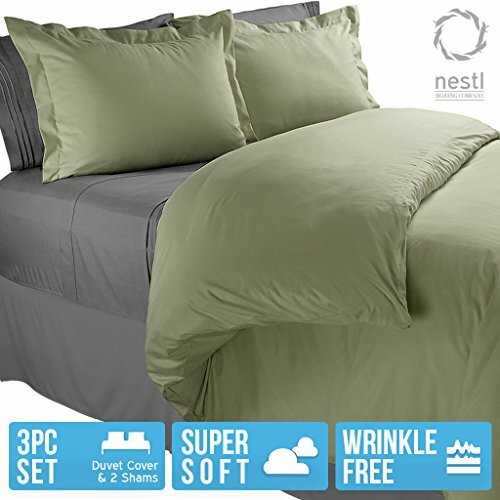 One thing we do know for sure when it comes to the Nestl Bedding Duvet Cover, Protects and Covers your Comforter is that’s impossible not to find the color you like as it comes in so many color options. The duvet cover is made with high quality double brushed microfiber strong linen that not only feels so soft against your skin, but it’s also long lasting. The cover comes in an impressive selection of vibrant dyed yarn solid color, giving you bedroom a splash of color. You also get two pillow shams that presents 1 ½-inch flange, so you don’t have to stress out about buying the matching pillowcases. As for the quality of fabric, we need to mention it’s very good. The duvet cover is fade, stain and wrinkle resistant. It doesn’t shrink, but it’s better to play it safe and machine-wash it only in cold water. Use the low temperature for a tumble dry. The duvet cover is great for anyone fighting some allergies at the moment as it’s hypoallergenic, dust mite resistant, and anti-bacterial. The fabric is environmental friendly, which is always something nice to hear. The duvet cover is cool and breathable so it’s nice to use even in the summertime. 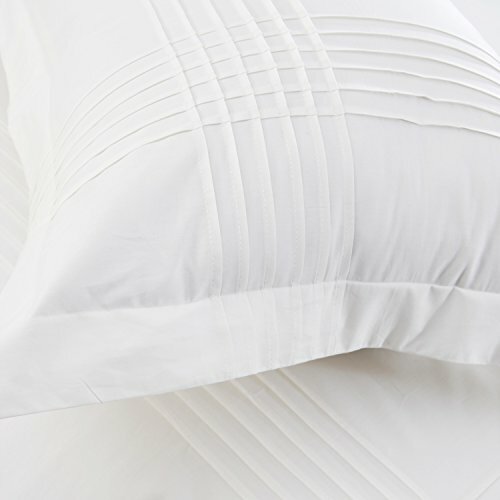 Thanks to the button closer, the duvet cover is easy to put on and to remove for cleaning. Feeling silky against your skin, the duvet cover is sure worth to try when in need. All things considered, for the silky feel and vibrant colors, the duvet cover is a good choice to keep in mind next time you’re shopping. 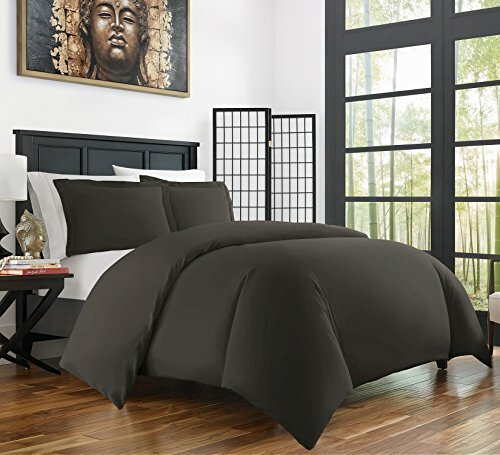 For those of you who want to try the bamboo comfort on the duvet cover, a popular choice is the Zen Bamboo Ultra Soft 3-Piece Bamboo Twin/Twin XL Duvet Cover Set. 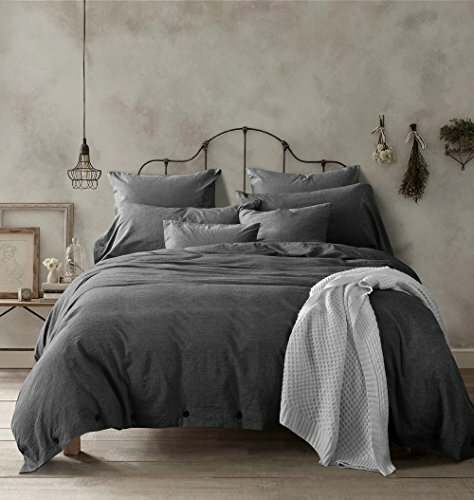 The duvet cover feels luxurious, stylish and incredibly soft. It comes in a nice variety of colors so it’s not impossible to find the one that you really like. The fabric is made with 40% rayon derived from Bamboo and 60% brushed microfiber. This results in a duvet cover that has an amazing plushy feeling but manages to be long lasting as well. 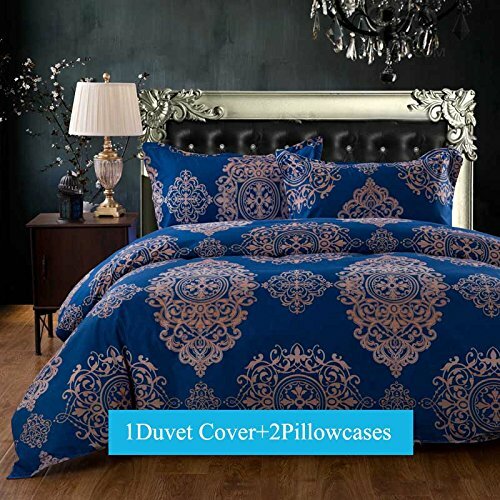 The duvet cover is very well made and comes with two pillow shams so you don’t have to search high and low for the right ones. The shams fit the standard sized pillows. We also like the duvet cover because it’s hypoallergenic and stain resistant. Its color is resistant and the duvet cover doesn’t fade. It doesn’t wrinkle either and you may eliminate the wrinkles from packaging in a quick drying. The duvet cover is a healthy option for the allergic customer as well as it’s hypoallergenic, keeping the dust mites at distance. Breathable and soft, the duvet cover is cool and keeps you fresh the whole night. Let’s not forget the corner ties that hold safely the comforter insert. The concealed zipper closure makes it easy for you to put on/take off the duvet cover. In order to preserve its qualities, it’s better to machine wash cold the duvet cover, along with similar colors. Tumble dry on the low setting and let it dry out in the open. The duvet cover holds its shape and handles frequent wash very well. It has no chemical smell in the beginning and is made to last. No matter the cons, we still like the duvet as it brings the breathability and softness of bamboo, increasing your comfort. 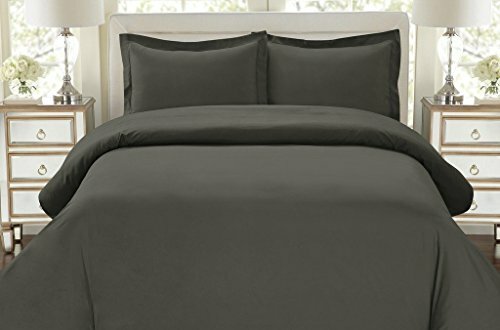 If you like, the luxurious feel when you’re sleeping, don’t hold back and give it a go with the Beckham Hotel Collection Luxury Soft Brushed 1800 Series Microfiber Duvet Cover Set. The set includes a nice duvet cover and one standard pillow sham. They are made with luxurious 100% brushed microfiber fabric and nice buttons across the bottom. The duvet cover brings a nice, elegant vibe to any room. The ultra-plush design gives you comfort in your sleep. The fabric isn’t just soft and nice against the skin, but also long lasting. It’s lightweight and easy to use. If you are prone to any allergies and asthma, the duvet cover is safe for you as it’s dust mite resistant and hypoallergenic. We like the duvet cover as it has such a nice feel to it. It’s well made and the seams look quite durable. The duvet cover washes well and you don’t need to iron it. Because it’s so soft, the duvet cover doesn’t catch pet hair either so you can definitely try it if you have some pets in your home. The zipper closure looks very sturdy and is so well hidden. The vibrant colors sure match the quality of the duvet cover. The duvet doesn’t have a specific smell in the beginning and is both stylish and durable. The minor flaws aren’t deal breakers for us and we like the duvet cover as a fairly priced, elegant option that brings comfort and luxurious feel for anyone. Give your bedroom a nice, bohemian feel with an artistic duvet cover like the Duvet Cover Sets King Size 3-pieces from TTMall. The duvet cover is made with 100% polyester microfiber and is more than meets the eye. 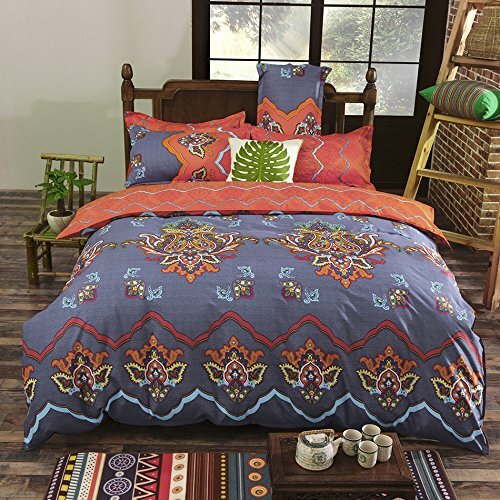 The nice blue vintage Boho Bohemia pattern is exotic, but we like the duvet cover for many other things. For instance, the duvet cover not only looks so nice, but it also has a soft touch feel that increases comfort when you’re sleeping. It’s easy to take care of the duvet cover, as it’s both durable and wrinkle resistant. You only need to machine wash it with cold water when in need and tumble-dry on low heat. You may iron it on a medium set and you should avoid bleaching and dry-cleaning. We also like a lot the versatility of the duvet cover, as the fabric is reversible. You may switch sides according to your mood, giving a new fresh feel to your room from time to time. It’s easy to put on the duvet cover as it features a zipper closure. The zipper is well hidden which makes the duvet cover more elegant. It also runs smooth which makes it easier to put on/take off the duvet cover. The duvet cover has a good built and feels so lightweight. It washes very well and may last for quite some time. Let’s not forget the duvet cover comes with two matching pillow shams so it’s easier for you to complete the new, bohemian style of your bedroom. The flaws aren’t deal breakers for us, and we still like the nice, artistic pattern of the duvet cover, but the cover brings a lot more to the table. Versatile and well made, the 3 Piece Duvet Cover and Pillow Shams Bedding Set is an elegant option when in need. The duvet cover comes with 2 matching pillow shams so you don’t have to pay the extra effort to find the matching pillows. The cover is made with 100% microfiber so it comes with the typical qualities of microfiber. It feels nice against your skin and lasts for quite some time. The duvet cover handles the sunlight pretty well and doesn’t fade out from wear. It’s also very easy to take care of as it’s wrinkle resistant. The design is great and the duvet cover is reversible which means you may flip it from time to time when you want to give a new fresh look to your room. Now that we’re talking about the design, we also need to mention the corner ties that hold your duvet insert steady in place. There is no shifting in your sleep so you may sleep comfortable throughout the entire night. As for the zipper closure, we notice how big and large it is, making the putting in/taking out a breeze. We like the pattern of the fabric, not only the softness. The fabric doesn’t wrinkle and washes very well. For the versatility, softness and comfort it brings in your sleep, the duvet cover still stands as a good option to try. If you’re hopelessly a big fan of cotton, put all your money in a duvet cover as the Hotel Collection Chester 100% Egyptian Cotton Percale Duvet Cover Set of 3. The duvet cover comes with two standard shams (king size) so you get a set that make change completely the appearance of your room. The duvet cover is made with 100% cotton, having a simple, yet elegant vibe to it. The set is made in India so you know it’s a reliable option. The design of the duvet cover is something to highlight and the pleats span the width of the duvet cover. The delicate lace on the edges embellishes subtly, yet so nicely the duvet cover. You truly get a duvet cover that manages to be elegant throughout its simple design. The button closure fits the elegance of the cover. It’s not difficult to put the cover on, nor to take it off. The duvet cover is lightweight and is pretty well made. It looks great, feels nice and gives a classy vibe to any room. Even though it’s made with cotton, the duvet cover doesn’t shrink nor wrinkles. The cons don’t make us change our mind on the duvet cover that we really like for its simple, yet elegant vibe. 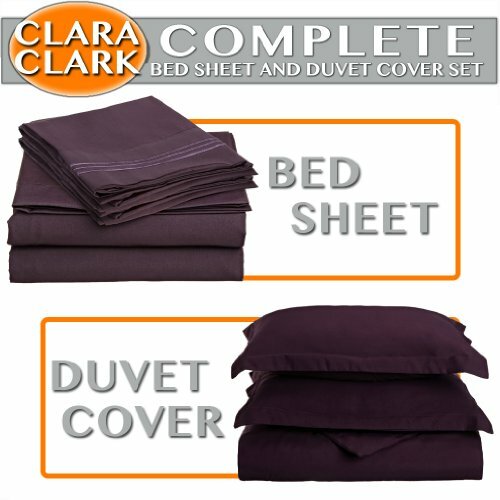 For the customer that doesn’t want to go shopping every week, a practical set that includes not only the duvet cover, but also all the things to make your bedding, a popular choice would be the Clara Clark Complete 7-Piece Bed Sheet and Duvet Cover Set, Queen, Purple Eggplant. You only go shopping once and pay a decent price for a flat sheet, a fitted sheet and 2 matching pillow cases and 2 shams. The duvet cover that is including matches the other items and looks very nice. Apart from the practical aspect, we like many things on the set. For instance, the fitted sheet features deep pockets which ensures a secure fit for your mattress. The elastic around the fitted sheet sustain an efficient snug fit also. All items are made with brushed microfiber and present a nice, soft touch feel. The sheets and the duvet cover are comfortable and look nice alotgether. The pillowcases present a nice embellished design and the triple rows of stitching applique give a nice, classic finish. The breathability of the sheets and all items doesn’t let you down and help you wake up fresh and dry each morning. The fabric used on the items is safe to use by anyone struggling with some allergies. The microfibers keep at distance dust, polle and pilling. We like the entire set as it’s also very easy to take care of. They don’t wrinkle and need no ironing. They dry fast and take well the regular use, without fading in time. You should machine wash them cold and only tumble dry on low. Soft, comfortable and satisfying all your needs for beeding at once, the set is a good option to try. Nevertheless, for the money you pay, you get a great opportunity to only shop once for a comfortable bedding. Give a powerful vibe to your bedroom with the Vougemarket 3 Piece Duvet Cover Set. The set comes with a bold, yet elegant pattern that makes a good impression on anyone and changes the atmosphere in your bedroom. The duvet cover and the two pillow shams look very well made, with nice and sturdy stitches. The fabric is 100% cotton, so it has a soft touch feel and takes the intense use for quite some time. The fabric isn’t just soft, but also hypoallergenic, becoming a healthy option for the allergic customer as well. It keeps at distance dust mites and your allergies altogether. The duvet cover comes with a concealed zipper closure so it’s easy to take it out/put it on. The ties on the inside holds in place the comforter insert and the pillow shams come with fold over slot, for better appearance. The duvet cover takes intense use nicely and washes very well. It doesn’t fade nor stain that easily. In order to expand its lifespan, it’s better to always machine wash it with cold water and similar colors. Tumble dry it low and never bleach. The colors soften a bit after washing and the set looks nice. Never mind the minor cons though as the set is comfortable, soft and looks so nice in any bold room. Once you go Pinzon, you can never go back, right? The Pinzon Pleated Hem 400-Thread –Count 100-Percent Egyptian Cotton Sateen Duvet Set is made from 100% Cotton, in Portugal and brings to your bedroom an elegant, classical vibe. The duvet cover comes also with 2 king size shams so you don’t have to make another shopping session any time soon. The fabric on the duvet cover is what impresses us the most. The cotton is sewn with single-ply yarns so the fabric is lightweight, breathable and has a soft touch feel. The duvet cover feels nice against the skin, but offers a smooth strength, taking well the intense use. We like the duvet cover as it’s lightweight and flexible, and breathable, helping you wake up dry and fresh each morning. Taking a closer look at the duvet cover lets us notice the nice pleating adorns sham flanges and the cover face. The duvet is easy to put on/take off as it features a nice button closure. The comforter is easy to insert every time. As for the pillow shams, they present an evelope design which looks nice and it’s so practical. The soft sateen finish, the good stitching and the nice display add up when it comes to the list of good things. For helping the duvet cover to last longer, it’s better to always machine wash in cold water and only tumble dry on low. For the amazing comfort, soft sateen finish and the elegant display, the duvet cover is a good buy any time. Even though they’re quite new to the market, don’t hesitate and give it a try with the New! 100-Percent Natural Washed Cotton Duvet Cover Set. The duvet cover is made with 100% washed cotton, which is a raw material, manufactured through a special process. Therefore, the cotton is softer and more comfortable. It’s a special fabric that is naturally intentionally wrinkled. It doesn’t have the softest touch feel, but a rather rough one. This doesn’t sacrifice comfort nor appearance as the set still looks nice and luxurious. The fabric is also breathable so you wake up fresh and dry after your night sleep. It doesn’t fade and is made to last for a long time. As a matter of fact, the duvet cover has a strong built and it takes the use for quite some time. The duvet cover comes with buttons closure so it’s not difficult to insert the comforter or to use the cover. The cover has just the right weight to it and a good size. The corner ties are a good detail and keep the comforter insert in place, with minimal risk for shifting. The set includes also two pillow shams that match perfectly and look very nice. The items have an interesting, flexible texture and the fabric is hypoallergenic. If you are struggling with some allergies, you may definitely try the set. As for the care, you only need to machine wash in cold water the duvet cover and the shams, with similar colors. Only tumble dry and on low and never bleach. 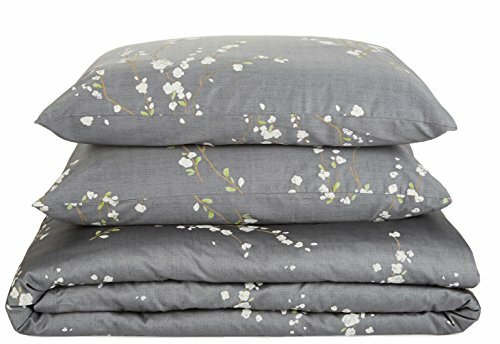 No matter the downsides, if you’re into the rather rough feel of a duvet cover, that is breathable and comfortable at the same time, don’t hesitate to give this set a chance. Turn your kind of boring bedroom into a vibrant, Moroccan vibe one with the Maxyoyo New! Boho Style Duvet Cover Set, Colorful Stripe Sheet Set. First thing, that strikes you on the set is definitely the powerful colors and patterns and this is why the set is a good option for anyone looking to bring another feel into the appearance of their bedroom. The set includes the duvet cover, one flat sheet and two matching pillow shams. The duvet cover is reversible and each side has the same, strong colors. However, it’s not only the beautiful colors that count on the set, but also the quality and the features. For instance, the items are made with 100% high quality sanded cotton. The fabric has a nice, soft touch feel and is so comfortable. It’s not thin, and its natural feel isn’t scratchy at all. It’s a durable fabric and the items are built to last for a good amount of time. The set presents not only an amazing design, but also nice features. The duvet cover comes with a zipper so it’s easy for you to insert your quilt or comforter. Due to the artistically pattern, the pillow shams may look a bit different from the picture. This is because of the random clipping. You may choose the Bohemian patterns that you like the most. In order to preserve its qualities, it’s better to not mix the set with other items on the first wash. Never use bleach and only use mild soap for the set. You may cool iron it if you like it better that way. For the great appearance, comfort and soft touch feel, the duvet cover makes a great investment anytime. No matter how your bedroom looks at the moment, take a leap of faith and give it an elegant, classic vibe with the Calvin Klein Home Pyrus Duvet Set. 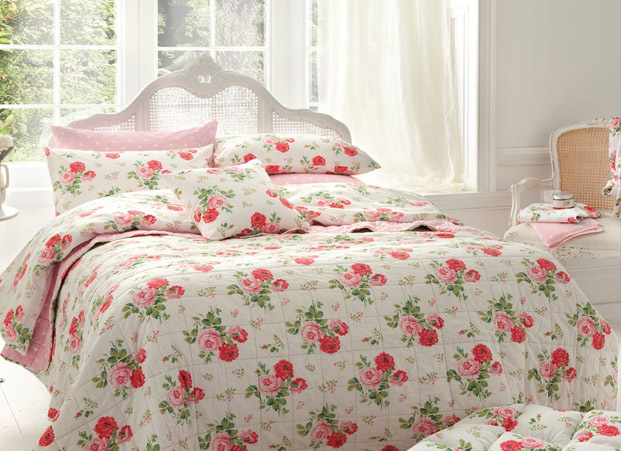 The duvet set includes a duvet cover and two matching pillow shams. The fabric is 100% cotton and has a soft touch feel. It’s comfortable and breathable so you don’t wake in the morning all sweaty. We really like the pattern of the fabric that sends you away to the blossoms of the Japanese pear trees. The duvet cover and the shams look nice and the subtle design warms up the atmosphere in your bedroom. The items are well made and the stitching has a durability feel to it. The cotton is high quality and feels so smooth. As for caring, it’s good to know the set washes very well, even with the machine. The minor flaws aren’t deal breakers for us and we still the warm pattern and the cozy feel the duvet cover and the shams do deliver.